Mr. Oshii has most recently been serving as the general manager for The Next Generation -Patlabor- series of live-action sci-fi films based on the popular anime franchise, which are currently being released every couple of months in Japan. 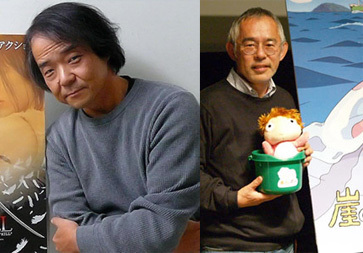 Interestingly, this isn’t the first time that Mr. Oshii has grilled Mr. Suzuki–you may remember reading this amusing transcript between the two from a radio chat in 2008 after the release of Ponyo on the Cliff by the Sea (which was produced by Mr. Suzuki). Mr. Oshii certainly had some strong opinions about the way in which the legendary Mr. Miyazaki had directed the film, even going so far as to say that “the film wasn’t put together like a proper movie.” But enough about that; let’s get back to the current meeting. Director Oshii kept badgering him though, this time asking, “Do you really intend to close [the production division of] Studio Ghibli? It’s a pain for the industry. Are you going to fire your animators and entire staff?” to which Mr. Suzuki replied, “Not all of them.” “So will you halve them?” Mr. Oshii continued. “I don’t know,” was Mr. Suzuki’s final answer.